Traditionally a Scandinavian spirit, aquavit is clear and heavily spiced, with caraway as the dominant flavor. We love a good, stiff bourbon or brandy cocktail during the winter. But when you've had your fill of toddies and Manhattans, why not branch out a bit? This January, we’ve been loving aquavit in cocktails—specifically, a New Hampshire-made version dubbed Skiklubben Aquavit. Traditionally a Scandinavian spirit, aquavit is clear and heavily spiced, with caraway as the dominant flavor. Generally served as an ice-cold shot, it’s stiff and bracing and, to put it nicely, an acquired taste. But Skiklubben, made by Tamworth Distilling since 2015 and now available nationally, is its own creature. Made from a whiskey base, it has a bit more heft and body than a traditional aquavit. And while the caraway is prominent, other elements including winter vegetables and spices (clove, anise, and cardamom) give it a balance and complexity that some aquavits lack. As a result, it’s surprisingly versatile in cocktails. Here are three we’re loving this winter. When most drinkers hear tonic, they have a hard time thinking beyond gin. Maybe vodka or tequila. But less traditional spirits can work well, too; here, the caraway of aquavit is a nice counterpart for the bittersweet tonic. A squeeze of lime helps it go down nice and easy. Instructions: In a tall glass with ice, combine an ounce and a half of aquavit and four ounces of tonic water. 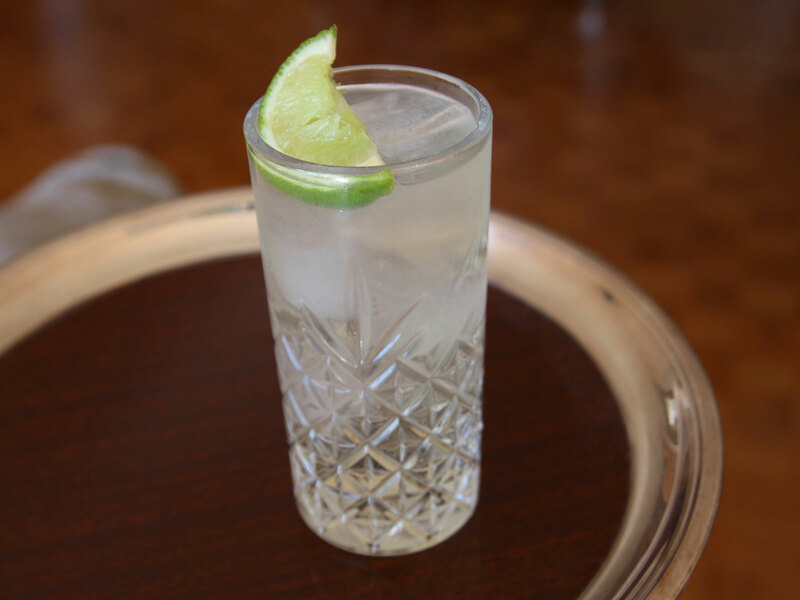 Garnish with a lime wedge, squeezed into the glass before serving. Think that whiskey and rum are the only spirits for toddies? Think again. This aquavit’s structure and body help it stand up well to hot water, while honey and plenty of garnishes—lemon, orange, clove, cinnamon—help brighten it up and bring out its own nuanced spice. Comes together in minutes. Instructions: In a heat-proof glass, combine two ounces of aquavit and one teaspoon of honey. Add two ounces of water just off the boil, and stir briefly until honey is dissolved. 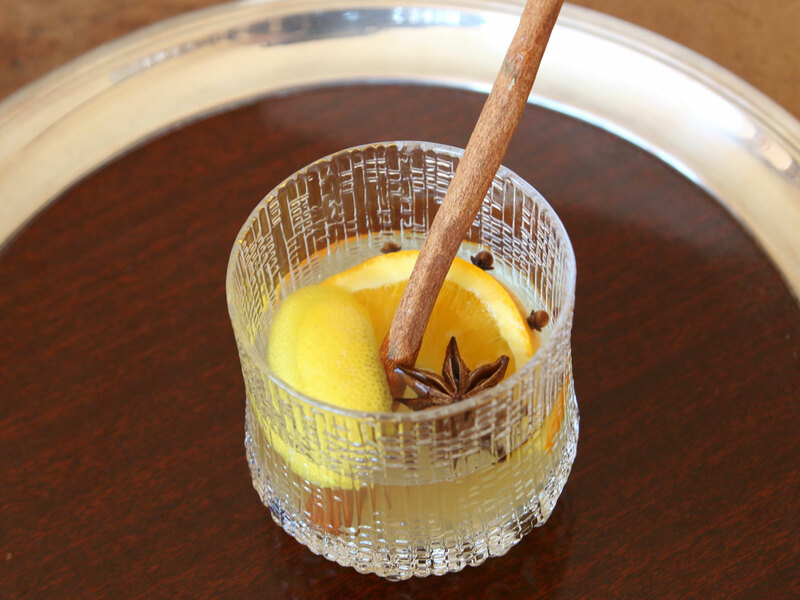 Garnish with an orange wedge, studded with a few cloves, squeezed into the glass; a lemon peel; a piece of star anise; and a long cinnamon stick. A traditional sour—that’d be a spirit with lemon, sugar, and egg white—is one of our favorite ways to showcase an ingredient we love. And when aquavit finds its way into a sour, it’s easy to appreciate all its complexity in a light, airy, easy-to-drink cocktail. Don’t skip the garnish; the sprinkle of caraway really makes this drink, adding a savory edge that brings it all together. Instructions: In a cocktail shaker without ice, combine two ounces of aquavit, an ounce of fresh lemon juice, 1/2 ounce simple syrup, and one egg white. Shake all that up without ice to aerate it—that’s called a “dry shake”—and then add ice and shake again for a “wet shake,” to chill it down. 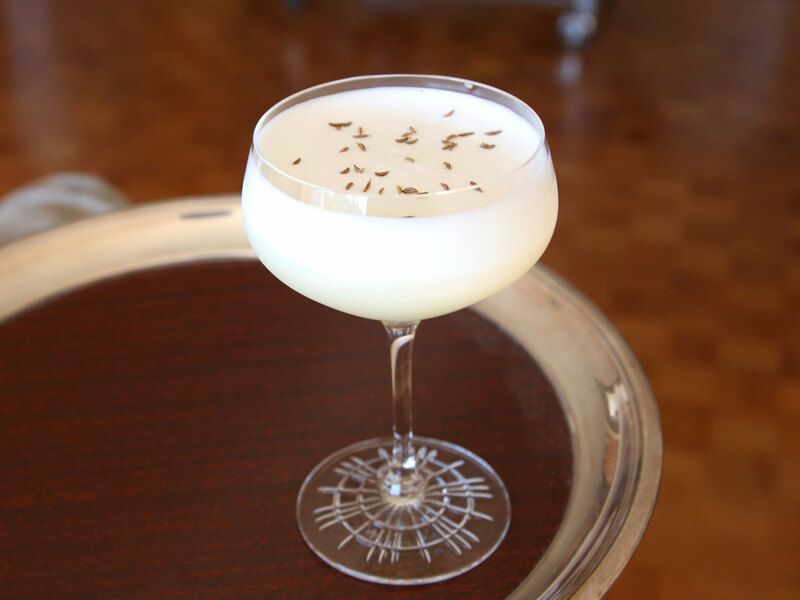 Strain into a chilled coupe, and garnish with a sprinkle of caraway seeds.